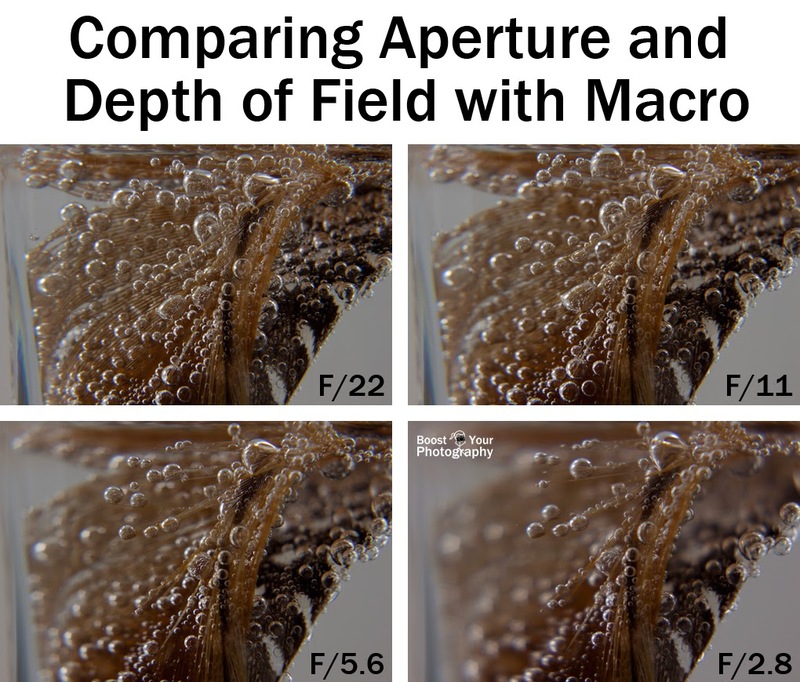 If you want to read about how to use close-up lenses in general, check out Inexpensive Close-Up Photography: close-up lenses or read Cheap and Easy Macro: comparisons and recommendations for a comparison of several methods of close-up and macro photography. What is a Close-Up Lens? The name "close-up lens" is a bit of a misnomer. A close-up lens is not a standalone camera lens but rather is a glass element that screws on to the front of an existing camera lens like a filter. The close-up lens acts like a magnifying glass and allows you to focus-in closer on your subject, which effectively increases the size at which you can photograph. When purchasing a close-up lens, you need to buy lenses that fit the diameter of your lens (or lenses). You can find the diameter size of your lens by looking for the Ø symbol on your lens. The Canon 18-55 mm kit lens, for example, has a diameter of 58 mm, while the Canon 50 mm f/1.8 lens and the Nikon 18-55mm lens have diameters of 52 mm. 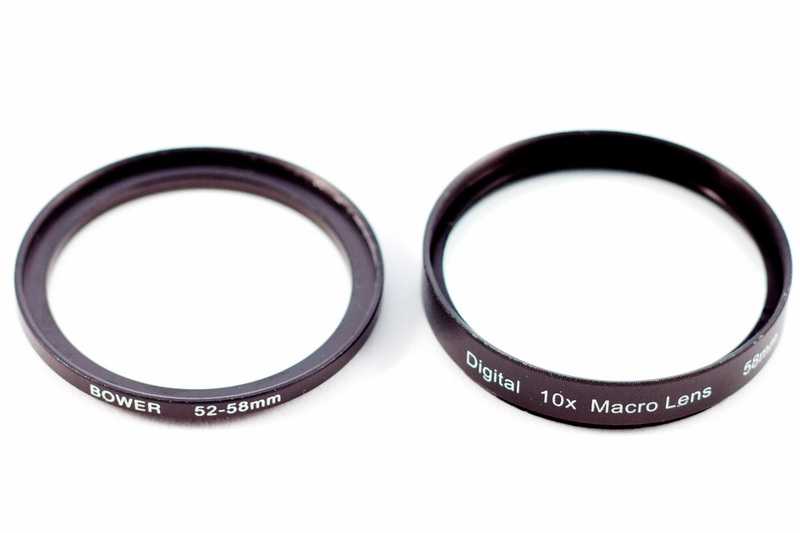 You can also purchase an inexpensive adapter ring to use larger filters on a smaller lens. I use a 52-58 mm step-up adapter to use my 58 mm close-up lenses on my 52 mm diameter lens. 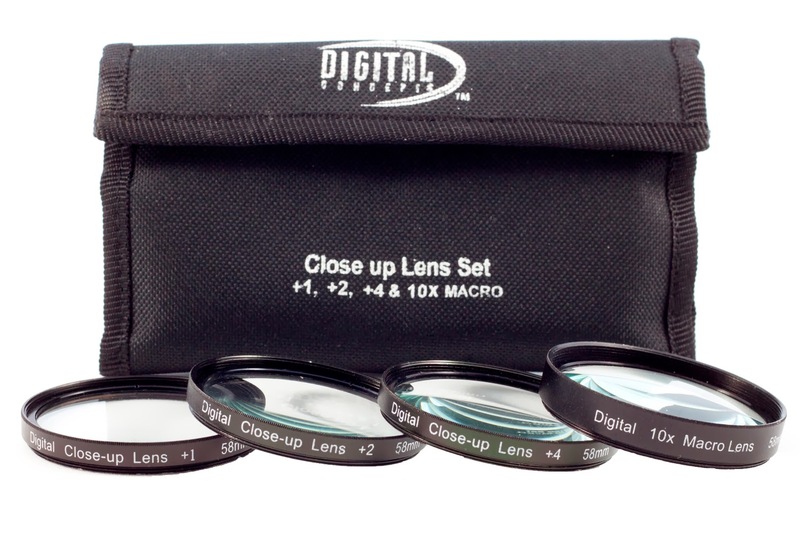 The Digital Concepts 58mm 4-Piece Multi-Coated Camera Lens Filter Set is a series of four close-up lenses at different strengths of magnification: +1, +2, +4, and 10x. It also comes with a nylon carrying case that has pockets for each of the four lenses, and it currently retails for around $12 USD. Filled, the case is the length of a sunglasses case and takes up about the same amount of room in your wallet or camera case. You can also bring a single close-up lens along, which slips easily into a pocket. To use a close-up lens, first remove any UV filter or other filters already on the front of your lens. Then, simply screw the close-up lens onto the front of your lens. You can even stack lenses on top of each other to amplify the magnification. I commonly use the +4 and 10x close-up lenses together. 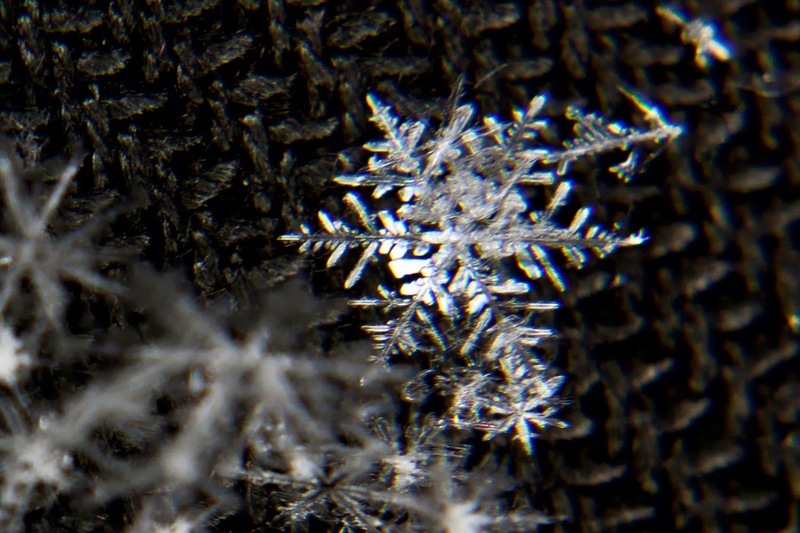 Cropped photograph of snowflakes, taken with +4 and 10x close-up lenses on 50 mm lens. One benefit of close-up lenses is that you are still able to use all of the functions and features on your camera, including autofocus. While I recommend using manual focus when shooting macro and close-up photographs, having autofocus as an option is always useful. The one difficulty that I have occasionally experienced is that the close-up lenses can get stuck together if you are stacking more than one or using a step-up adapter. The solution is the same as any time you get a filter stuck on your lens: use a rubber band. Wrap the rubber band around just the outside filter or close-up lens. It will usually give you enough grip to loosen the stuck one and remove it. All of the following photographs were taken with one or more of the Digital Concepts close-up lenses on the Canon 50 mm f/1.8 lens using the Bower 52-58 mm adapter. Another consideration when shooting macro and close-up photographs is the working distance of the lens. Each of the shots above was taken at the greatest magnification possible, which means that the camera and lens were as close as possible to the subject, while still maintaining focus. For the 50 mm lens alone, this working distance (approximate distance from the front of the lens to the area of the subject in focus) was around 13.5 inches. Adding the +1 close-up lens brought the working distance down to 9.5 inches. The +2 close-up lens focused at a minimum distance of 7.5 inches, while the +4 close-up lens focused at 5.5 inches. The working distance for the 10x close-up lens was 3.5 inches, and the +4 and 10x combined was around 2 inches. This is not much of a concern when shooting stationary subjects, like the bottle of nail polish, but it can make it difficult to shoot a moving subject. Skittish butterflies are not always too keen on photographers sneaking up three inches away from them, for example. A final consideration is light loss. Because a close-up lens is simply an additional piece of glass on the front of your lens, it does not significantly affect the amount or quality of the light captured by the camera. 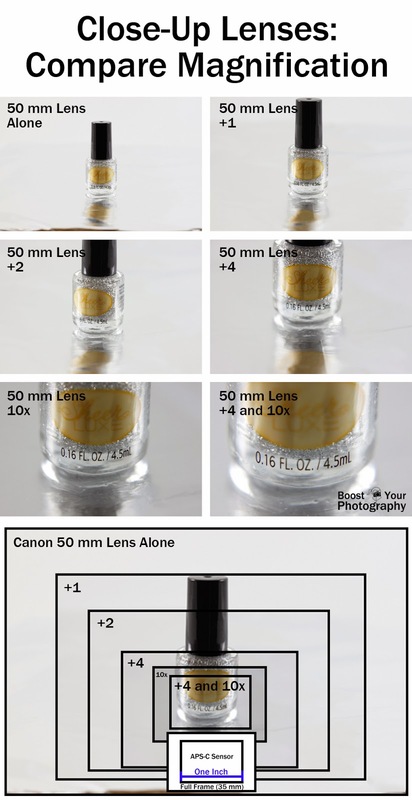 Each of the photographs of the nail polish, above, were shot in Aperture Priority mode with ISO 100 and f/5.6, using a tripod to eliminate any possible shake. The shutter speed was 1/15 th of a second for the 50 mm shot, 1/20 th of a second for the four photographs with a single close-up lens, and 1/13th of a second for the +4 and 10x close-up lenses combined. The impact of changing the aperture is apparent. At f/22 it is just about possible to get the bubbles at the front and the back of the feather in focus - a total distance of under an inch from front-to-back. The f/5.6 and f/2.8 images really show the narrowing down of the depth of field, as more and more bubbles fade into background blur, which isolates the forefront bubbles that remain in focus. By f/2.8, only the closest bubbles remain in focus. Some of the bubbles themselves are too large (deep) that the entire bubble, front-to-back is not in focus. 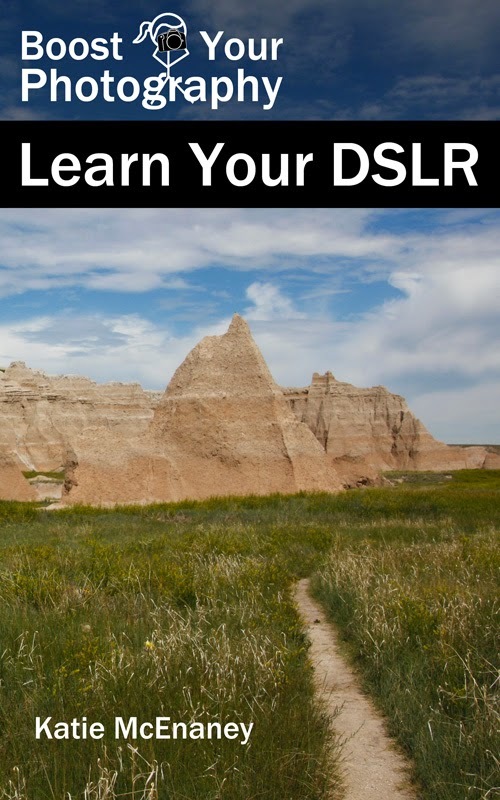 This razor-thin depth of field is a feature of close-up photography, not just the close-up lenses, but it is important to keep in mind when shooting close-up and macro photography. I am a huge fan of my Digital Concepts 58mm 4-Piece Multi-Coated Camera Lens Filter Set. They are my go-to close-up photography accessory, and I commonly carry the 10x close-up lens with me when traveling or going on a photo walk. It only takes a few seconds to grab it out of my pocket, screw it on my lens, and start shooting close-up photographs. No need to switch lenses outside. Plus, for around $12 USD, why not try a set of close-up lenses before shelling out $600 for a dedicated macro lens (Canon 100 f/2.8)? Addendum: Bryan Peterson, in his book Understanding Close-Up Photography, speaks very highly of the Canon 500d close-up lens, which works as a filter, just like the Digital Concepts version. At $90-150 USD, depending on which diameter you need, this is still a pricier investment. Peterson bemoans the quality of cheaper close-up lenses, but I have been quite happy with mine. What about you? Do you shoot with close-up lenses? Are you happy with your results? 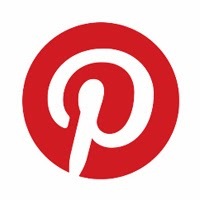 Share your thoughts or a link to relevant pictures in the comments below.